The Golden Eagle Aquila chrysaetos in Italy. A survey on the Golden Eagle Aquila chrysaetos in the Italian Western Alps (Liguria to Aosta Valley) was initiat ed in 1972. Since 1983, one of the authors (FB) started collecting data and since 1986 has been monitoring the whole population in the Cuneo province (Fasce et al. 2011). Every year the highest possible number of the known pairs was monitored in different periods, as recommended by Fasce (1982), i.e. at least three times: before laying, during brooding and rearing and after fledging. Furthermore, new potential territories have been explored. We collected data about pair composition, nests used and reproduction. Whenever it was not possible to carry out monitoring during the breeding period, one or more visits were carried out post fledging (in August and September), following the methodology suggested by Fasce (1982), consisting in at least three long observations of the pair, without the young interacting with them. The number of known pairs has progressively increased and is now 168. We evaluated the population at the beginning of the study to be between 70 and 90 pairs in the study area (Fasce et al. 2011): therefore the population has almost doubled. The increase was progressive (Fig. 1): in 1984 the number of known pairs was 82 (Fasce & Fasce 1984); in 1992 it had increased to 91 (Fasce & Fasce 1992), in 2003 to 129 (Fasce & Fasce 2003), in 2008 to 144 (Fasce et al., 2011), in 2013 to 160 (Fasce & Fasce 2013). The province of Verbano Cusio Ossola (VCO) lies in the northern part of the Piedmont region. It covers a surface of 2223 km2 and its altitudes ranges from 193 to 4599 m a.s.l. ; 64% of which lies over 1000 m a.s.l. The climate is shaped by abundant rainfalls (1200-2500 mm/year) and typical continental winter temperatures, which tend to be milder in the Eastern part of the province thanks to the mitigating presence of Lake Maggiore. Woodland cov ers a major part of the VCO province (38%), consisting mainly of deciduous trees. Colonizing woods and shrubs (14%), alpine pastures (11%), moors and shrubs (9%), rocks, scree and river beds (8%), pastures and cultivated lands (7%) and sparsely vegetated lands (6%) follow in decreasing order of surface extent. Water covers approxi mately 4% of VCO surface, whereas urban and suburban areas stretch over 3%. Less than 1% is covered by per manent snowfields and glaciers (CORINE Land Cover; C.E.C, 1993). Available data for the Golden Eagle in the VCO province are not recent and substantially date back to surveys carried out more than a decade ago (Bionda 2003, Bionda & Bordignon 2006). Since then, the present author did not continue to monitor intensively the Golden Eagles. This study covers the period from 1996 to 2005 and cen suses were primarily carried out in March and April, when reproductive activities are taking place (Fasce 1982). After mapping the potential territories, pairs’ core areas were de fined by means of observations made from vantage points, usually in valley bottoms. Recording sessions were con centrated in the first part of the day. One aim was to record the starting point of pairs’ daily activities, marking and territory-defence flights (undulating flight, circling pairs), along with matings, transport of twigs and green matter to add to nests or exchanges of adults at nest during the brooding period. Suitable cliff faces for nest building were checked by means of binoculars and telescope. Surfaces of single pairs’ territories were estimated by defining their boundaries on the basis of searching, marking and terri tory-defence flights. The distance between territories was then used as index of population density, and this was cal culated by means of the nearest neighbour distance method (Newton 1979). Territories for each pair were based on the distance away from the only known nest or alternatively on the centroid of the polygon drawn connecting all nests be longing to that pair. The above surveys recorded the pres ence of 23 territorial pairs, 5 of which defended territories that partially overlapped the Italian-Swiss border: 4 terri tories stretched over the eastern boundary (Tessin Canton) and 1 over the western boundary of the province (Valais Canton). The mean distance between two adjacent territo ries was 7.15 km (min 4.7; max 13.8; SD 1.96). A total of 49 nests were recorded, ranging from 1 to 6 per pair (mean 2.3; SD 1.4). When comparing the status of the Golden Ea gle population with that of ten years ago, at least one new territory has been recorded since then, along with 8 further nests, one used by a new pair and seven used by known pairs. In the last ten years, two attempts of gaining new ter ritories along the eastern (near Lake Maggiore) and south ern (Mount Mottarone) boundaries of the province were recorded. In both attempts, territorial activities were regu larly observed, but no nests were found. Both territories were defended for one single season. The Golden Eagle Aquila chrysaetos has been regarded as one of the most representative breeding bird species in the province of Trento, and has been the focus of several research projects since the 1980s (Pedrini 1992, Pedrini & Sergio 2001a, 2002), as well as several conservation initiatives (P.A.T. 2011, LIFE11/NAT/IT/000187 “TEN” Trentino ecological Network; www.lifeten.tn.it). The Golden Eagle is classified as “vulnerable” in the Red List of birds breeding in Trentino (Pedrini et al. 2005). Its conservation status, coupled with the importance of this species for the Trento province, promoted research projects in the past (Sergio et al. 2006) and also monitoring activities in several protected areas in Trentino (Adamello Brenta Park, Stelvio National Park) and in other pre-alpine mountain areas (carried out by Muse, formerly Museo Tridentino di Scienze Naturali). This paper provides an update of the conservation status of this species in Trentino, on the basis of the ongoing monitoring activities, and compares it with the status of this species at the national level, which is considered “inadequate” mostly because of the reduction of high-altitude grasslands (Gustin et al. 2016). The current knowledge on the Golden Eagle Aquila chrysaetos in Alto Adige is the result of several data collection work that took place in the last 30 years. However, a complete knowledge of this species is not yet available. The large spread and distribution of this species on the territory, the difficulties in carrying out observations due to the topography and the lack of a general plan of continuous monitoring, all make it difficult to unequivocally assess a general trend for this species in the Alto Adige territory. To overcome these difficulties, a database composed of previous knowledge deriving from observations by gamekeepers, from targeted field monitoring during triennial projects, and from systematic observations by amateur enthusiasts has been used. We put together data collected during a three-year monitoring project about birds of prey in the Fanes-Senes Braies and Puez-Odle natural parks (Borgo 2001), data from the Italia-Austria 2003-2005 Aquilalp Interreg project regarding the Fanes-Senes-Braies Natural Parks, Vedrette di Ries-Aurina and Stelvio NP (Bliem et al. 2005), data collected in 2011-2014 on behalf of Markus Kantioler (Ufficio Parchi Naturali) about Alta Val Pusteria, and by Klaus Bliem (Stazione forestale Silandro) for the Stelvio NP (2002-2016) and the entire Val Venosta (2006-2016). The monitoring of the Golden Eagle Aquila chrysaetos population in Friuli Venezia Giulia was carried out at a regional scale only in the mid 90s (Genero & Caldana 1997). Since then, regional data was never updated; however, since 1999 a systematic monitoring of the species has been carried out by the “Parco Naturale delle Dolomiti Friulane” (PNDF), covering almost the whole mountainous sector of the Western Friuli (Borgo 2009a), a total area of 690 km2. The update of the situation and knowledge level are therefore very heterogeneous, as the PNDF acts as a sample study area for the monitoring of this species at a regional level. The PNDF performs this long-term monitoring of the Golden Eagle because some population parameters and diet composition have been identified as indicators of factors and dynamics affecting the ecosystem (fanALP 2010). Observations, carried out through established methodologies, has been focused on the monitoring of pairs, nests localization and determination of the typical parameters used to study the breeding biology of the species. Data collection on the diet was carried out by observing prey transport to the nest or, in rare cases, by collecting prey remains at the end of the breeding season (Borgo 2009a). The pair density has been measured using the Nearest Neighbour Distance method (NNDM). The historical occurrence of the Golden Eagle Aquila chrysaetos in the Northern Apennines is supported by many documentary evidences, and confirmed by several toponyms that include the Italian term “aquila” referred to mountainous locations near nesting sites or where this raptor was frequently observed. This raptor was probably more widespread in the past and faced a strong demographic decline due to centuries of human persecution until 1977, when the killing of raptors was definitively banned in Italy. Nevertheless, a number of breeding pairs survived in the wildest locations of the Apennines, most of which were gradually included inside protected areas. Studies on the status of the Northern Apennines’s breeding population date back to the 1980s (Fasce & Fasce 1984) when a total of 8-10 breeding pairs was reported. Updated reports were published some years later by Chiavetta (1994), Chiavetta (2001) and Fasce & Fasce (2003). An improved collection of standardized data from the late 1990s, achieved through the coordination of volunteers from different regions of the study area (Liguria, Tuscany, Emilia-Romagna) resulted in two more recent reports (Magrini & Perna 2007, Schiassi et al., 2013). Currently the monitoring of the breeding population is supported by over 20 observers through regular controls of known pairs and home ranges, according to a standardized field protocol. The Golden Eagle’s Aquila chrysaetos population in the Umbria-Marche Apennines has been monitored since 1979. The most recent information covering the period up to 2012 was published, in 2013 (Magrini et al. 2013). Since then, research has continued for four years, totaling 38 years of monitoring activities concerning the main population parameters considered representative of the whole Italian peninsula. The study area is 5000 km2 wide and consists of the main mountains, mostly calcareous, of Umbria and Marche between 150 and 2476 m a.s.l. A bibliographic research and a collection of testimonies were carried out from the beginning of the study, with the earliest data available dating back to 1912 (Ricci 1929). Each year the pairs breeding activities have been recorded through a minimum of three visits to the nesting territories in the February-August period. Data concerning the mean number of fledged young per pair (productivity) and the mean number of fledged young per successful pair have been collected following Cheylan (1981). In the first half of the Twentieth century the Golden Eagle’s population in the Umbria-Marche Apennines reached its maximum total with about 25 pairs. In the period 1979-1990 the number of recorded pairs was never higher than 9 or 10. Since 2014 the number of pairs present amounts to 18, with an increase of 80% compared to the 1979-1990 period. The population density has grown from 2 pairs/1000 km2 to 3.6 pairs/1000 km2. The Golden Eagle Aquila chrysaetos is present with one pair in the Foreste Casentinesi National Park, where it has been regularly monitored since 1993. Between 1993 and 1999 it nested on a rock at 900 m a.s.l. ; then it built at least 4 nests on large fir trees along the north slopes with dense forest cover. Tab. 1 summarizes nesting data. The nest located on the rock was used 10 times with the fledging of 8 young; confirmed nesting on fir trees was observed on 7 occasions, while in 3 other occasions breeding could not be confirmed; 5 young fledged from the nests on fir trees. Two fledglings occurred in 1993 (rock) and again after 24 years in 2016 (fir). In 2016 a research program was carried out in the Sasso Frati Nature Reserve, within the National Park of Foreste Casentinesi, M. Falterona and Campigna, in the Romagna region (province of Forlì Cesena, Italy). A 10x binoculars and 20-60x telescopes were utilized for direct observations. The reproduction phase was followed regularly between March and August. The 2016 breeding (after 6 years of apparent failures) is unprecedented for the great difference in the development between the two chicks, the first fledged in mid-July (between 12 and 18) while the second left the nest in mid August (between 13 and 21), with a delay of about one month compared to its sibling. A significant part (about 20%) of the population of the Golden Eagle Aquila chrysaetos in the Central Apennines breeds in the mountains of Lazio. The breeding performance of these pairs has been monitored since the midseventies of the last century (Novelletto & Petretti 1980, Allavena et al. 1987, Borlenghi 1992, Zocchi 1992, Zocchi & Panella 1996, Borlenghi & Corsetti 1996, 2002, 2004, Borlenghi 2005, Borlenghi et al. 2014). Since 2014 this activity was included in the “Monitoring Net of Rupicolous Raptors” of the Lazio region, in accordance with the Birds Directive (2009/147/EC). In recent years we have seen the participation by staff members from the protected areas in the monitoring of these birds. The main purpose of the Golden Eagle breeding monitoring project in Lazio is to obtain all the necessary information to improve the conservation of this species through specific actions. The area used by this species in Lazio, is estimated at 3,800 km² (Borlenghi et al. 2014), and corresponds to the main mountainous systems of the region. Breeding pairs are distributed in the Laga Mts, Reatini Mts, Carseolani Mts, Lucretili Mts, Simbruini Mts, Ernici Mts, Mt. Cornacchia Group, Meta Mts, Mt. Cairo group and Lepini Mts. In four other mountainous systems (Mt. Pozzoni, Mt. Giano, Duchessa and Aurunci Mts) it’s possible to observe immature pairs, not yet nesting, and/or floaters (Fig. 1). In all these territories the annual monitoring has been carried on in the January-August period. The knowledge about the presence and the distribution of the Golden Eagle Aquila chrysaetos in the Abruzzo Region up to the end of ‘900 is probably partial and not exhaustive. In the paper “Birds of Abruzzo and Molise” by the ornithologist Nicola De Leone, with observations from 1908 up to 1932, this species is frequently reported as present in several municipalities (De Leone 1933). In more recent papers the number of known pairs is between 8 and 14. Presence and distribution data have been further analyzed in “Central Apennines” (Chiavetta 1978, Zocchi 1992, Allavena et al. 1997, Spinetti 1997, Borlenghi & Corsetti 2002). In 2003, the Abruzzo ornithological station promoted a full survey over all of its territory, revealing the presence of 16 territorial pairs, confirmed through nests in the administrative boundaries of the region (Magrini et al. 2007). Other breeding pairs were present in Abruzzo but they were found nesting just outside the administrative borders (Artese pers. obs.). Since 2003, monitoring continued uninterruptedly for the entire population, although some pairs were not studied. The Abruzzo region covers 10795 km2, 7029 of which are classified as mountain. Excluding the urbanized areas of Aquilana, Peligna and Fucino planes, the remaining territory foothills and mountain is suitable for this species. 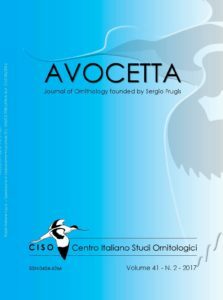 In recent decades, the Golden Eagle Aquila chrysaetos population in Italy has been negatively affected by numerous environmental transformations determined through anthropogenic actions: the gradual abandonment of traditional agricultural practices, together with the remarkable decline in pasture activity, mainly at higher altitudes, represent some of the threats that directly affect the species (Mathieu & Choisy 1982, Huboux 1984, Esteve & Materac 1987, Fasce & Fasce 1992, Pedrini & Sergio 2001, 2002). In an unfavourable context, especially in regions such as Calabria, where these negative factors have had considerable intensity, the role of protected areas has proved to be fundamental for the preservation of many species at risk: the Aspromonte National Park, in collaboration with Federparchi, has thus decided to carry out a systematic study on the Golden Eagle, a species so far never investigated in this area. The research, still ongoing, is aimed at obtaining the ecological knowledge about the local population, useful for planning, and where necessary, interventions aimed at protecting and preserving this important predator. In Calabria the Golden Eagle is sedentary, nesting and irregularly migratory (Scebba et al. 1993): the bibliographic surveys indicated a stable presence in the Pollino National Park with 4 pairs (Viggiani 1999, Pandolfi et al. 2007) and in the Aspromonte National Park, with at least one pair (Malara 1999). The historical presence of this species in the Aspromonte territory is, on the other hand, reported by Moschella (1891), who reports two killings near Reggio Calabria and a stationary pair near Africo. Apart from its wide continental distribution in the Palaearctic, Nearctic and, partially, in the African and Indo-malayan regions, the Golden Eagle Aquila chrysaetos occurs also in the largest Mediterranean islands (Ferguson-Lees & Christie 2001). The largest population lives in Sardinia (57-70 pairs, Ruiu this volume), 32-37 pairs have been recorded in Corsica (Seguin et al. 1998) and 16-22 pairs of the A. c. homeyeri subspecies in Crete (Xirouchakis 2001). It has been also listed as vagrant in Cyprus and Malta (BirdLife International 2016), while it became extinct in the Balearics (Viada 2006) and in the Aegean and Ionian islands (Xirouchakis 2001). Presence and breeding in Sicily has been recorded since the early XIX century (e.g. Palazzotto 1801 in Massa 1985). More recently, research on the Golden Eagle in Sicily has been usually focused on breeding phenology and distribution during fieldwork for Regional Atlases of breeding birds (Massa 1985, Lo Valvo et al. 1993, AA.VV. 2008), as well as a subject of a PhD thesis and post-doc grant (Di Vittorio 2007, 2011). Such data originating from a specific conservation project in the Madonie Regional Park (Sarà et al. 2011) and allowed for some investigation on the species’ habitat preferences in the island (Di Vittorio & Sarà 2009, Di Vittorio & López López 2014). Habitat preference modelling showed how mean altitude and slope in the eagles territory are the most important topographic variables, together with the extension of open habitats (arable land and grasslands), to predict the occurrence of the Golden Eagle in Sicily. Actually, the species occupies most of the northern ridge of the island from west (Trapani mountains) to east (Peloritani Mts). Pairs living in the south-western Sicani Mts are connected to the main range in correspondence to the Palermo mountains, while pairs living on Etna are embedded bebetween the Nebrodi and Peloritani. The Golden Eagle has never been recorded breeding in the south-east corner of the island (Erei and Iblei Mts). This research aims to fill a knowledge gap on the current status and distribution of the Golden Eagle’s Aquila chrysaetos nesting pairs in Sardinia. To date, no recent data or censuses in the scientific bibliography about the situation of this raptor in Sardinia exist (Fasce & Fasce 1992, Asuni et al. 2003, 2004-2005, Brichetti & Fracasso 2003, Grussu 1995-1996). The only scientific reference is that by Helmar Schenk, dating back to 1976, who estimated the Sardinian population of Golden Eagle at a minimum of 25 pairs and a maximum of 38 (Schenk 1976). This species was considered to be at risk, mainly because of direct threats by farmers due to the supposed damage caused to their livestock (Fasce & Fasce 1984). More recently, several authors documented a much higher number of pairs, estimating 40/50 pairs of Golden Eagles breeding in Sardinia (Schenk 1995, Asuni et al. 2003, Fasce & Fasce 2003). These estimates are mostly based on generic assumptions, without precise territorial references, with the exception of some investigations, carried out with rigor and over a period of several years but concerning only limited portions of the island territory. The most recent report related to a specific geographic area is dated 2009 and covers the territory of the former Province of Olbia Tempio, where 7 nesting pairs were censused and 8-10 probable pairs were estimated (Trainito 2009). The data provided in this report covers about 80% of the island’s territory, corresponding to perfectly identified geographic areas, and are the result of direct field research about the observation of pairs during the courtship period, the verification of the occupied nests, the successful outcome of chick rearing, the analysis of the behavior of young immediately after their fledging, as well as the estimation of the occasional groupings of more “families” in the autumn period. Unpublished data originate from direct observations and from verified testimonies. A comment about the meeting`s results.